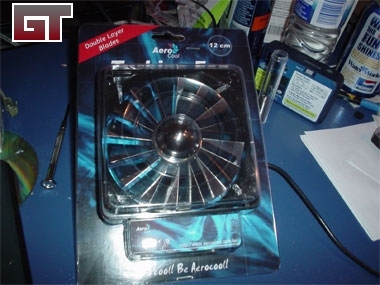 The Aerocool Turbine Fan comes equipped with a double layer fan blade design to improve air pressure. At 16 fan blades, it uses more than any other 120mm fan on the market. 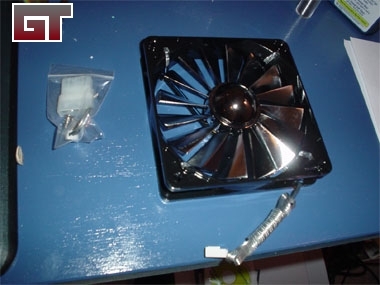 Originally I had thoughts to use this quiet but deadly fan in a mod, but decided to use it to quiet down a rackmount case. That's correct, that is 37.4 CFM at only 19.66 dBA. Most of the fans I have are 80mm and run around 28-32 dBA in noise. This one has cut the sound level in my rackmount case to the point where I hear the old mail server over it (a P3 800 with two 80mm fans in it). I also can still feel the air being pulled through the 1" fiber air filter. Double layer fan blade design for improved air pressure. Choice of silver coating, titanium coating and transparent blue. 16 Fan blades! More fan blades then any other 12cm fans in the market!